Grading involves much more than examining the cover. To accurately assess a comic book, you need to carefully examine each page to ensure it doesn’t contain defects such as graffiti, tears, repairs or missing pieces. Many times, books contain things tempting a reader to clip them out such as coupons and Marvel Value Stamps. I notice that many people at shows don’t ask to open a book before buying it. Nor do many ask if there are notable problems inside it. They tend to carefully examine the book’s cover then make a decision about purchasing it. Fortunately, I am not a deceptive seller. I take great care in examining each and every comic book I grade, inside and out, before putting it up for sale. I note any problems and price it accordingly so the buyer is fully aware of its condition. However, there are many sellers who apparently have never heard the phrase “don’t judge a book by its cover”. Whether they are deceitful or simply being careless, there are too many transactions that involve a damaged book for which a buyer has paid too much. Books graded by 3rd party grading services such as CGC provide an excellent means of shopping safely as details regarding damage and restoration are clearly labeled on the slab. But if you’re like me, you may prefer books that you can open, read and enjoy. So before buying your next collectible book, ask to examine it in its entirety. An honest seller will be willing to show you the book – just take extra care when looking at it. The most common things you’ll likely find on the pages inside are writing and torn pages. You may also find crude repairs involving tape or staples. Some books have coupons that could be sent off (and thus cut out) or puzzles that were often filled in. All of these problems impact the value of the book and you need to consider how detracting they are. Sometimes readers would cut out a favorite frame from the story. Often, frames of artwork appeared on the “Bullpen Bulletins” page, which were also commonly cut out. 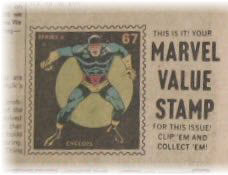 Then in 1974, “Marvel Value Stamps” were introduced. These were frames made to look like postage stamps. You’d find them on the letters page. Marvel sold a stamp book separately so readers could cut out the stamps and tape them in the stamp book. There were two series with 100 stamps in each. Series A featured a different character or set of characters on each stamp. The stamps were published in different books between March of 1974 and December of 1975. Not every book published during those dates had a stamp but there were a total of 307 books containing stamps. During the same month, Series B was introduced which featured stamps that were part of a puzzle. There were 10 puzzles with 10 stamps each. This series ran until August of 1976 and were a little harder to find as they were in only 110 books. 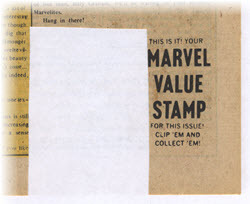 The design of the Marvel Value Stamps encouraged readers to cut them out so the issues that featured them are more commonly found to be damaged. Usually the opposite side of the stamp was an advertisement but there are some that affected the story when cut out, which is a much more devastating defect. Below is a list of issues containing Marvel Value Stamps and there are several valuable issues with Incredible Hulk 181 (1st full Wolverine appearance) being the most expensive.